The Piper PA-18 Super Cub is a two-seat, single-engine monoplane. Introduced in 1949 by Piper Aircraft, it was developed from the Piper PA-11, and traces its lineage back through the J-3 to the Taylor E-2 Cub of the 1930s. In close to 40 years of production, over 9,000 were built. Super Cubs are commonly found in roles such as bush flying, banner and glider towing. While based on the design of the earlier Cubs, the addition of an electrical system, flaps (3 notches), and a vastly more powerful engine (150 hp), make it a very different flying experience. Although the "standard" Super Cub was fitted with a 150 horsepower (112 kW) Lycoming engine, it was not uncommon to see them equipped with a 180 hp (134 kW) powerplant. 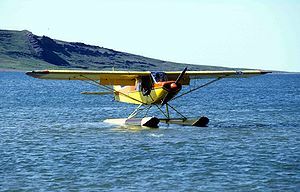 The high-lift wing and powerful engine made the Super Cub a prime candidate for conversion to either floatplane or skiplane. In addition, the PA-18A (an agricultural version) was produced for applying either dry chemical or liquid spray. The Super Cub retained the basic "rag and tube" (fabric stretched over a steel tube frame) structure of the earlier J-3 Cub. The first true "Super" Cubs had flaps, dual fuel tanks, and an O-235 Lycoming engine producing about 108 hp (115 hp for takeoff only). However, a 90 hp Continental without flaps and an optional second wing tank was available. Their empty weight was, on the average, 800-1000 pounds with a gross weight of 1,500 lb. These Cubs would take off in about 400 feet (at gross weight) and land in about 300 feet (thanks to the flaps). The Super Cub is renowned for its ability to take off and land in very short distances. The O-290 Lycoming powered Cubs (135 hp) followed and would take off in about 200 feet (61 m). The landing distance remained the same at about 400 feet (120 m), or 300 feet (91 m) using flaps. With the use of the Lycoming O-320 at 150-160 hp, the Cub's allowable gross weight increased to 1,750 lb while retaining the capability of a mere 200 feet (61 m) for takeoff. Prototype and production variant powered by a 95hp Continental C-90-8F piston engine, sometimes known as the PA-18-95. Production variant fitted with a 105hp Lycoming O-235-C1 piston engine and larger tailplane. Special variant built in 1952 and 1953 for the Civil Air Patrol as a trainer with horn balanced elevators and provision for seat parachutes. Variant to replace the PA-18-95 with flaps and horn balanced elevators and a 125hp Lycoming O-290-D piston engine and either or a metal controllable-pitch propeller. Variant with a 135hp Lycoming O-290-D piston engine and fitted with two wing tanks as standard. 1954 variant with a 150hp Lycoming O-320. Experimental variant with a 180hp Lycoming O-360 engine, one built in 1980 by Piper. Other aircraft have been re-engined under a Supplemental Type Certificate. Designation for production aircraft with different engines built as single seat cropdusters with a wider rear fuselage holding a hoppertank in the back seat. Designation for production aircraft fitted with floats. Designation of a small number of agricultural aircraft fitted with floats. Original designation of the military variant of the PA-18, only three built and all subseqeuent military production were designated as PA-18s. Military designation of the PA-18 Super Cub for the United States Army, powered by a 95-hp (71-kW) Continental C90-8F piston engine, 838 delivered 108 of which were delivered to other nations under MDAP. Two Super Cub 135s for evaluation by the United States Army. Military designation of the Super Cub 125, powered by a 125-hp (92-kW) Avco Lycoming 0-290-II piston engine, 150 delivered. Military designation of the Super Cub 135, powered by a 135-hp (101-kW) Avco Lycoming 0-290-D2 piston engine, 584 delivered many to other nations under MDAP, re-designated U-7A in 1962. A number of L-21As were converted into training aircraft. 1962 redesignation of the L-21B. Taylor, John W.R. Jane's All The World's Aircraft 1976-77. London:Jane's Yearbooks, 1976, ISBN 0 354 00538 3.